That dry hop at high krausen makes a beautiful mess! - missed my pre-boil gravity by seven points, i have never missed a gravity target by that much. reviewed my process and didn't do anything different than i normally do and am consistently within a point or two. same crush as normal, 90 minute mash, 10 minute mashout 75 minute sparge. if anything, i thought my gravity would be a touch high since the pid was indicating 150 as the mash temp for the longest time. it was 152 at the top of the bed, must have taken a while to heat through the whole bed. it was at 152 about 20 minutes after mashing in so that doesn't seem like the problem. in any event, skipped a longer boil time in favor of adding some dry malt extract, hit 1.064 post-boil. - first time doing a hop stand. used my old immersion chiller to cool, dropped the kettle down to 174 in about three minutes, very fast. i intended to stand at 170 vs 180 so i set my pid to that temp and let sit for a half hour. i don't think the heating element even fired during that time. started chilling and all was going well until i noticed a hot burnt smell. it was near the end of chilling and i realized what happened: i never turned my boil element off. i can only assume the kettle liquid dropped below the rtd and element, temp dropped below 170 and the element fired. took the kettle lid off to be greeted by a wonderful charred smell and a jet-black element. not wanting to risk transferring any scorched flavors/aromas to the chilled wort, i stopped filling the carboys. carboys smelled fine so disaster appeared diverted. scorched element impossible to clean. finally busted out a stainless pot scrubbie, that took the char off, not sure if element damaged. - sunday night, i filled the boil kettle with 7 gallons of water and set about to get it boiling, to test the element. element heated up fine and there was a little scorched odor, must have been cooking off some more crud. i let it boil for about ten minutes and cleaned everything up. i'm satisfied with using it again. - i added the biotransformation hops as krausen was starting on saturday mornuing, 12 hours after pitching. i am using 6 gal pet carboys and always have blowoff so my thought was it would be too hard to add hop pellets with the head space filled with krausen. as of last night, lots of krausen but only a little blow off and i went to bed with the carboys sounding like a machine gun with all the co2 coming out of the tubes and bubbling up through the blow off vessel. - missed my pre-boil gravity by seven points, i have never missed a gravity target by that much. if anything, i thought my gravity would be a touch high since the pid was indicating 150 as the mash temp for the longest time. Mash temp doesn't affect gravity. It affects how fermentable the wort is. not wanting to risk transferring any scorched flavors/aromas to the chilled wort, i stopped filling the carboys. carboys smelled fine so disaster appeared diverted. scorched element impossible to clean. finally busted out a stainless pot scrubbie, that took the char off, not sure if element damaged. Probably best you dumped the charred beer as it would have likely tasted like an ashtray. 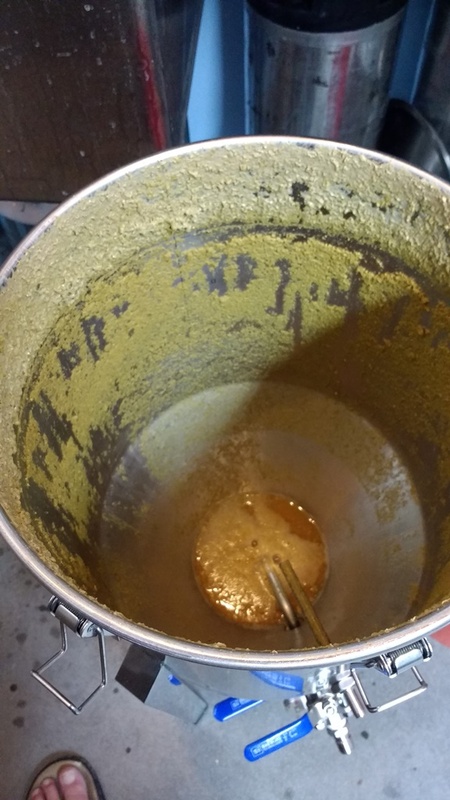 - i am using 6 gal pet carboys and always have blowoff so my thought was it would be too hard to add hop pellets with the head space filled with krausen. - opened up my temp-controlled chest freezer fermentation chamber this morning to a blown carboy cap (cap still on carboy, just the little white cap blew off). hop debris on the bottom lid of the freezer and some beer at the bottom. crap. i only have dainty 3/8" tubing coming off my caps, not some giant 1" tube or something like that so that was my undoing. With the 7 US gallon buckets filled to the 5.5 to 6 gallon mark I've actually never had any krausen enter the blowoff tubes which has been nice. I don't find 6 gallon primary fermenters large enough, especially without any headspace. (Not just for this beer, but just about any beer). You can do it if you ferment a smaller amount, but then you end up with a keg that's 80% full. despite these setbacks, beer smelled great this morning. The smell is one of the best parts! Cheers! you are right about that mash temp vs. gravity vs. ferment-ability, brain fart on my part. oh, i knew i was pushing my luck with this one. why they don't make 6.5 gal pet carboy is beyond me but with a larger blow off tube, i probably wouldn't have had a problem. almost all my beers blow off but i have not had an issue with not being able to fill a keg all the way. last beer i did was a mild and even that had some blowoff, probably a function of putting too much wort in the carboy. i still had almost a growler of beer left over at kegging time, i think i'll reduce batch size on these smaller beers in the future. i stopped home at lunch time to check on everything, all good, seems like the worst of the krausen is behind me. smelled even better than it did this morning! I weigh out in 5 lb increments and because I have the memory of a gnat and easily distracted, I always write down what I'm at on my recipe sheet in pen. Ex: 5, 10, 15, 20, etc. why they don't make 6.5 gal pet carboy is beyond me but with a larger blow off tube, i probably wouldn't have had a problem. I don't even think that's big enough. Back when I used fermentation buckets, they were 7.8 US gallons (6.5 imperial) and that was perfect. 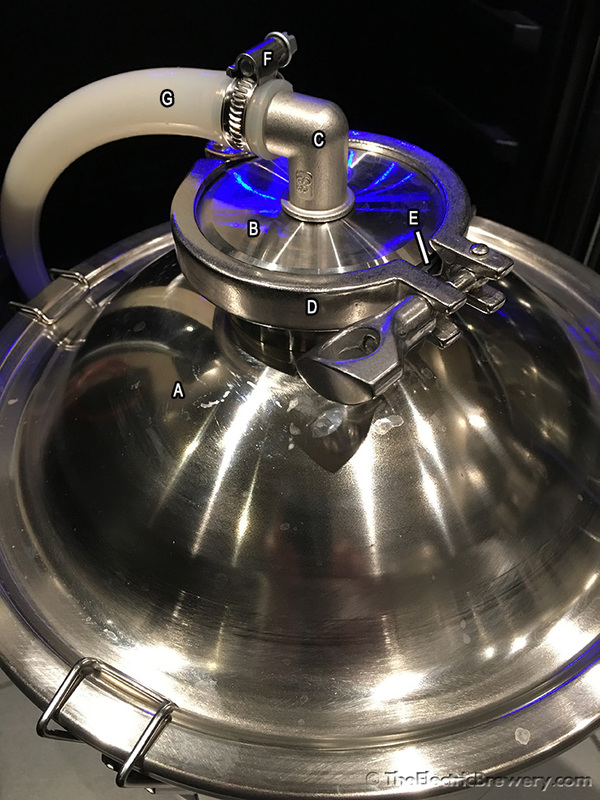 So when I went stainless I knew I wanted the same size which meant adding domed lids on my 7 gallon stainless buckets. So far so good - I get some krausen sometimes on the inside of the domed lid but so far nothing up the blow-off tube. I want to keep those hops in the beer where they belong! Enjoy! Let us know how the finished beer turns out! even though i'm an all-grain guy, i have extract around for making starters but if folks don't go the starter route, can't hurt to have a little dme around for times like this! Exactly. A pound or two of DME in a beer like this won't be noticed. Not a huge IPA fan, but this was easily one the best IPA that I've had. So good in fact that it makes going out to the bars to try new beer less fun. Other beers are so plain and flavorless now. Glad you liked it Fal! First post here and loving what you're doing. Ive brewed a few NEIPA and going to give yours a try next for my Christmas brew. Ill be brewing a 5 gallon batch. Thanks..BTW Unbelievable setup you have yourself there. Your water's very soft (not much in it) so you shouldn't have any problems getting to the right numbers. Glad to hear you're enjoying the site and thanks for the compliments. Good luck with the beer! Had a play around. Think ive got the additions worked out apart from the Calcium is 135 not 100?????? That'll be fine - I wouldn't worry about it since calcium is essentially flavour neutral. I was just looking at my own spreadsheets for when I brewed this and just realized that I probably should have mentioned that while 100 is the target, with my brewing water (city tap water) I end up with Calcium at 122-123. It's a minor difference. Hope the brew went well! Hit my numbers exactly. 1.065 already in the fermenters. I really need to brew this! I really like a few of the NE IPA's I had this year. Keep an eye on it - the blowoffs tend to get even more crazy after you add hops!